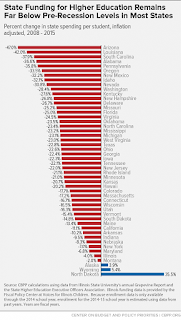 Arizona has the dubious distinction of being first in the nation for college budget cuts and tuition hikes. So once again, the state is garnering national attention for the wrong reasons. The headlines could have been different. 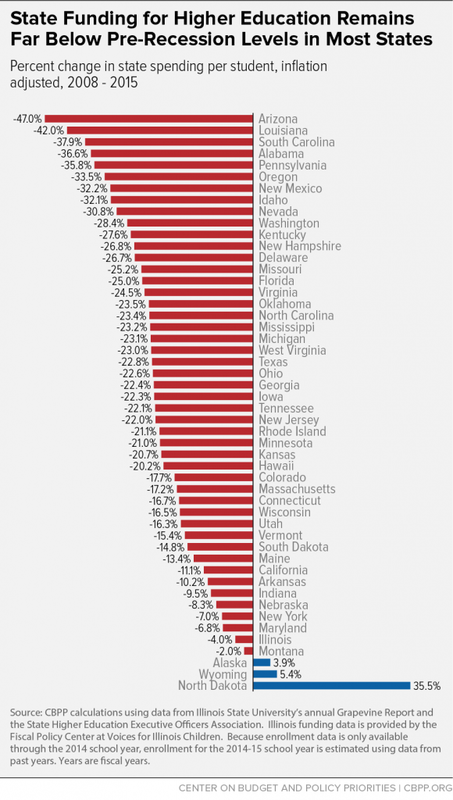 For years, Republican leaders chose to cut education – showing that they have no real plan to invest in the future of our children or our state. A new report from the Center on Budget and Policy Priorities shows that when states divest from universities they make college less accessible for students and jeopardize economic stability. The report identifies Arizona as the worst offender. According the study, Arizona’s in-state per student spending dropped 47 percent, the most in the nation, between 2008 and 2015. And this finding does not include the $99 million cut from Arizona universities or the more than $15 million cut from community colleges that Republicans served up in the budget they passed this year. This news comes shortly after an announcement that Arizona dropped to 41st in the nation for per capita personal income – with no indication that will change soon. There is so much research pointing to a relationship between education and economic opportunities. Clearly, any real economic recovery plan must include a substantial investment in education. We must hold the Republican leadership accountable for their choices. To learn how to get involved to make education a priority at the Legislature, click here.